ALM Rangers Demo Factory Team release their first demo nuggets!!!! Suppose you have this scenario, a team is working on company office to create some software that communicate with some complex hardware that will be deployed to a foreign country. When is time to set up everything in production the team goes physically to that foreign country and they will modify the software on the field doing final adjustments but usually they have no connection to the central office. How could you manage to keep your source code aligned when the team is on remote site not being able to access the central TFS? If no local person will access the team project during the period in witch the team is in the remote site, you can create a Project Collection dedicated to that team, then when the team will move to the remote site, they detach the collection, bring it with them with another installation of TFS, and when theyâ€™ll come back into the office, they will reattach the collection to the original TFS. If people from central office should being able to access the Team Project from central office, while the team is working on code on customerâ€™s remote site, Integration Platform could be the solution. 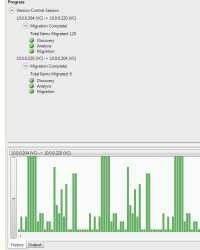 You starting creating another installation of TFS (usually on a virtual machine), and create a Team Project with the same name of the original Team Project or a similar name like original name portable, then install the Integration Platform on this Virtual Machine and configure an integration between the two Team Projects. First of all open the Integration Platform interface, choose â€œCreate Newâ€ and then choose Version Control if you want to keep in sync only source code, or VersionControlAndWorkItem if you want to keep in sync both WI and Source. Figure 1: Choose to synchronize only version control if you are not interested in Work Items. Now you need to specify the two Team Projects that you want to keep in sync, you can store the credential to access those two server in Windows Credential Manager, the final configuration should resemble those one in Figure 2. Figure 2: Configuration of Integration platform to keep in sync TailSpin toys and another Team project on a portable Virtual Machine. Now you can press â€œsave to databaseâ€ and the configuration is ready to be executed simply pressing the start button. When the integration runs, you can be presented with conflicts, this is an example. 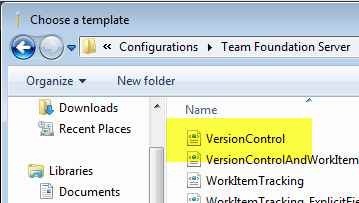 The problem is that the destination Team Process Template already contains that specific file (it is a default file for a Team Project), so you need to resolve these conflicts simply telling to the Integration Platform the changeset you want to keep for each conflicts. Since this is the first synchronization between a full project and an empty one, the only conflict you can find is in the three default build template files. Now you can stop the synchronization, take the Virtual Machine with you and let call it REMOTE TFS. When you are in the remote customerâ€™s site all team members will create a new workspace against REMOTE TFS. During the typical working day, the remote team will operate on REMOTE TFS, then you need to synchronize everything with the central server when you are able to reach your primary server again. Usually this happens when the team returns to the central office. Now you will open the Integration Platform interface again, open the right synchronization project and press start again, now all the modification done to REMOTE TFS will be migrated to your central TFS. Figure 3: The integration platform tool moves back all changeset to the central TFS machine. The comment contains the original comment (modification to the interface) as well as complete note from Integration Platform on the original check in date, and the original user that issued the check-in. To minimize the chance of conflicts during the integration, I strongly suggest to the remote team to create a branch in the original TFS before the synchronization starts, then during remote work they will work on that branch against the REMOTE TFS, no one from the central office should touch that branch. Finally when the team returns to the central office you start again synchronization from the Integration Platform and you are sure that no conflict will occour. When the sync is complete, that remote branch is now the â€œreleaseâ€ branch, because it contains the code that is actually running in the customer factory. If you choose a sync configuration that will keep in sync even the Work Items, the remote team is able to create bug, issue to keep tracks of what is happened during remote development :). TFS is not a tool, but a platform/ecosystem and if you miss to install / consider to use all of the free or commercial tools based on Tfs, you are actually missing the most part of it. Surely TFS comes with a very huge amount of features out of the box, but there are also an extremely high number of useful tools developed by third party developers. Here is a surely incomplete list (Iâ€™ll try to keep it updated) and in random order of a bunch of tools I know for TFS ecosystem. Tfs Integration Platform: An open source tool to manage synchronization between Tfs and integrate with other tools/system. It is used by Microsoft to keep the pioneer Tfs synchronized. Tfs Sidekicks: An entire suite of tools to manage TFS. Team Explorer Everywhere: TFS support for eclipse, officially released by Microsoft, gives to Eclipse user quite all features of TFS, WI management, Source Control support, Builds (gated check-in supported), and much more. Test Case Migrator: Migrates test case between projects. AIT TaskBoard: A cool TaskBoard interface for TFS, You should also check for AIT Word to TFS and all tools from AIT. Wit-It: One click Work Item access from TFS Alert Emails, whenever you receive a Work Item email alert in outlook this plugin can visualize details of the Work Item. Tfs Rangers Solutions and Projects: An impressive amount of guides and tools to work with TFS. 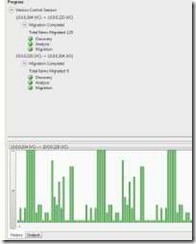 Tfs Monitoring Mangement Pack: Monitor configuration of your TFS to be sure that everything is in good health. Outlook Tfs Addin: Associate Outlook Mail to WI as attachment. SvnBridge: permits you to use TortoiseSVN to access TFS source control system. Tfs Build Extensions: lots of useful extensions to use with your TFS build. Fissum: Systray tool to access Work Items quickly. Tfs Deployer: Use the Quality attribute of a Tfs build to automatically trigger a powershell script that will automatically deploy your solution. All codeplex project related to TFS: This is the list of all codeplex project regarding TFS, it will contains all the project that I do not know. Tfs on the Road: Thanks to the oData service for TFS here is a nice application to access TFS from your Windows Phone. MSBuild Explorer: Not a specific tool for TFS, but since MSBuild is still a really good way to automate build operations, this tool can save you lot of time. Tfs 2010 SDK: A set of examples based on TFS API to help you writing .NET code that interacts with TFS. Tfs Development Center: MSDN home page to work with TFS. Tfs SDK for java: Now you can write adding and access TFS from java code :). Custom Controls For TFS Work Item: Good codeplex project with custom controls for WI management. OData Service For TFS: Provides an OData service for TFS 2010 to help developing TFS tools for smartphones and tablets. Urban Turtle: An impressive amount of features to add agility to your TFS process. (list of features here). TeamLook: Manage TFS from Outlook, especially useful for managers that work primarily with outlook. They have also TeamSpec, a tool to manage Work Items in Word. Team Companion: Probably the most complete to manage TFS from Outlook. It leverage Outlook features to provide unique capabilities. TX Looker: an addin from TeamExpand to make Outlook communicate with TFS. WTM: A really cool tool to manage and run Microsoft Test Manager plans from a Web Interface.